I have the same issue when having a fresh installation of Naigos Core 3.4.1 on Centos 6.3. Can you or someone help to resolve the issue? What group should I use in my case? 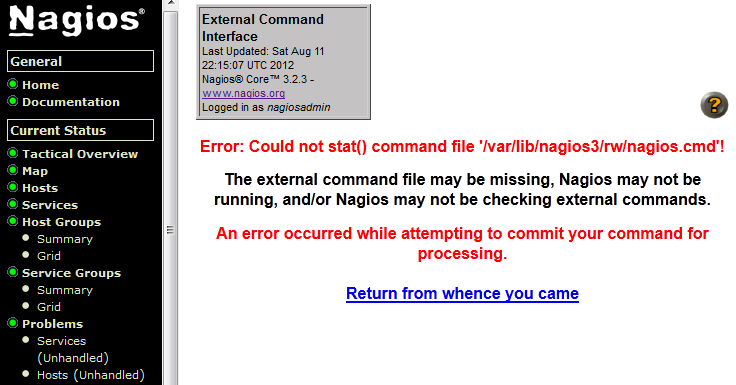 I am using Naigos Core 3.4.1 on Centos 6.3. There is no www-data group in my case. What group should I use? I use apache as the group, but still get the same error. I have changed ownership to Apache and it doesn’t work. Surprisingly I have ownership set to nagcmd on Ubuntu and it worked without changing ownership to ‘www-data’. Can you help me with this error. I get this when I am trying to enable notification or send custom notification. Ab my system (Debian 2.6.32-46) I had to changed the permissions of the directory /var/lib/rw and not the file /var/lib/rw/nagios.cmd. # Permissions should be set at the directory level instead of on the file, as the file is deleted every time its contents are processed.